“YOU’VE NEVER SEEN ANYTHING LIKE ME BEFORE!…..” says the Ghost of Christmas Present. performance is suitable for all but the very young and includes the company’s ever-popular backstage tour. 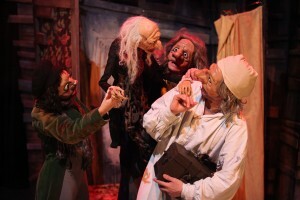 A masked chorus lead the characters through the hidden doors and windows of the higgledy-piggeldy set and their conversations with the audience make each performance unique. 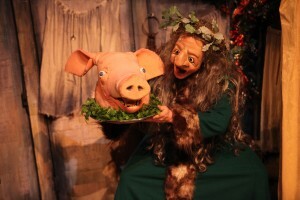 The company features performers who have previously worked with Trestle Theatre Company, Faulty Optic and Green Ginger. 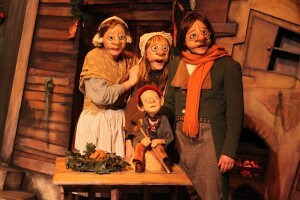 A Christmas Carol toured to venues across the UK from 2009 to 2011 including Christmas residencies at The Gulbenkian, Canterbury and The Stables, Milton Keynes. This production can be revived for future christmas performances. Contact us for more information.